According to the U.S. Food and Drug Administration, the number of times drugs were in short supply almost tripled from 61 in 2005 to 178 in 2010. The figure reached more than 250 in 2011. This means that manufacturers reported to the FDA that they were unable to meet demand for the drugs. Hospital and health-system pharmacists, as well as oncologists, anesthesiologists and other specialists have also increasingly reported difficulties acquiring drugs. These are mostly injectable drugs for cancer and other important therapies, and they are frequently produced by generic drugmakers. These drugs are not dispensed by community pharmacies, but rather administered by health professionals in clinical settings. Currently proposed solutions are unlikely to address the crisis satisfactorily. 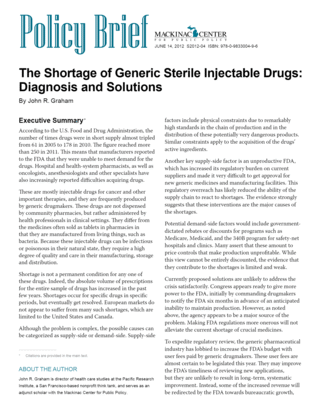 Congress appears ready to give more power to the FDA, but making FDA regulations more onerous will not alleviate the current shortage of crucial medicines. A more promising approach is to make it easier for competitors to enter the market in response to forthcoming shortages. In general, this means reducing and ultimately removing the FDA’s monopoly on the approval of drugs for medical use. Shifting these medicines to Medicare Part D insurance may also stabilize supply by helping ensure manufacturers receive adequate compensation for the medicine, even as taxpayers are protected from escalating costs.